There are SO many craft tools gadgets these days it’s hard not to want everything. 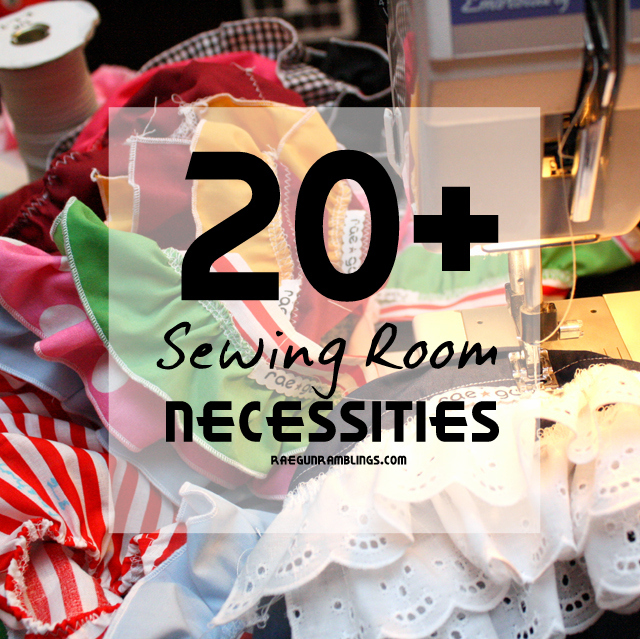 But you can really have a super well stocked sewing room with just a handful of items. Today I’m sharing MY new room necessities. sewing machine – You don’t need any thing super fancy. I’ve had both fancy and basic and for what I do basic totally does the job. The only reason I like the “fancier” ones is that they have more powerful motors and can handle ALL the sewing I do. This is hands down my favorite sewing machine for beginners and even those who sew a lot like me! serger – I have a whole long post about how much I love my sergers and how to buy a serger you will love and actually use too. But if you’ve never used one they are kinda like a microwave, unnecessary but once you try it you’ll wonder how you lived without one. They just make things faster and easier. If you sew a lot it might be worth looking into. magnetic pin holder – I don’t do pin cushions that requires too much attention I’ve got this awesome magnetic wand (you find it right on the notions wall) and I just lob the pins at it while I’m zipping along. It’s also great for grabbing pins that may have fallen onto the floor! cone thread holder – Serger cone thread is so much cheaper than those tiny spools all you need to use it is an inexpensive holder. You can find one on the notions isle and that way you can save on your thread costs! I like this one. iron– Sewing is the only time I iron. But some times you need to press things into place. ironing board and/or pad – I have both a traditional ironing board that I use every once in a while and a big flat style one that I made that I use All.The.Time. Check out my Ironing Pad tutorial to make your own. pattern weights – I stole my moms pattern weights when I went to college. One of the best decisions of my life. I’m all about pinning as little as possible and with these babies you don’t even need to pin when you’re cutting out a pattern. Guys they are life changing! Ginger scissors – Ginger scissors might be expensive but wait until they go on sale or use a 50% off coupon because they are Worth.Every.Penny! But don’t forget to instill the fear of your wrath in your family so no one tries to use them on paper. My favorite are the dressmaker shears. paper scissors – I’m always finding stuff that I don’t want to use my good scissors on whether it’s downloaded printed patters or something else. loop turner – Oh my friends I did not know about this magical tool until I was married. But once I was introduced I fell in love. You can turn very small straps or larger ones without all the smooshing, scooching slowness of a safety pin or chopstick. Want to learn more, I wrote a whole post about why the loop turner is the best kept sewing secret. embroidery scissors – I use these for everything. Snipping threads, cutting button holes, you name it. I am an adamant seam ripper hater. Really I’d rather spend more money and start a project over, well almost. But I use my embroidery scissors to carefully pull out mistakes (in fact I have a technique I’ve been planning on sharing schedule for the blog next week so make sure you check back in it’s like magic). Plus I’m a little addicted to buying these cute tiny cutters. quilting ruler – I love the small clear 2X18 inch lightweight ones (often with blue or red grid lines). I use them for so many tasks from pattern drafting to just measuring out elastic. Once again another notion wall must have. large rotary mat – I love my giant rotary mat. I recommend getting the biggest one that can fit your space you won’t regret it! large rotary cutter ruler – You know those hard plastic ones? These will help make straight line cutting a breeze. I am not a quilter but I use mine all the time. fold out paper mat – Some times I like to work on the floor when I’m making adult sized things and I have a great card board folding cutting board that is fabulous. I can’t use the rotary cutter on it but it makes laying out patterns so much easier. kid art paper – I know they have special pattern drafting paper but I’ve been using rolls of kids craft paper and it does the job. There’s a roll leaning on my cutting table as we speak. disappearing fabric markers – These are like magic. If you need to transfer pattern markings or if you’re making multiple items and need to keep the pieces straight (like sizes for example) these are great. chalk pencils – As much as I like the fabric markers they don’t show up on dark blue and black. For that purpose I love a good white chalk pencil. quilting pins – Pins are one of those things that are totally personal preference but I like those long quilting pins with the big heads, easy to use and find. Unless I’m using really delicate fabric they’re my fav. elastic thread – Have you ever sewn with elastic thread? It’s surprisingly easy and that’s how you can get that cool stretchy gathered (fake smocked) look. Check out my tutorial to learn how to sew with elastic thread if you don’t know how! fabric – And last but not least fabric. You gotta have it! Did I miss anything? If I did let me know in the comments I’m sure my baby brain is leaving something important out but as I’m scanning my studio that’s all I’m seeing! I’ve mentioned the Facebook page The Daily Sew before but in case you need a refresher it’s a wonderful site where TONS of great bloggers contribute to bring the best sewing tips, tutorials, and sewing bonding. I have found some of my favorite tutorials, hilarious sewing jokes, as well as in genius time saving tips there. 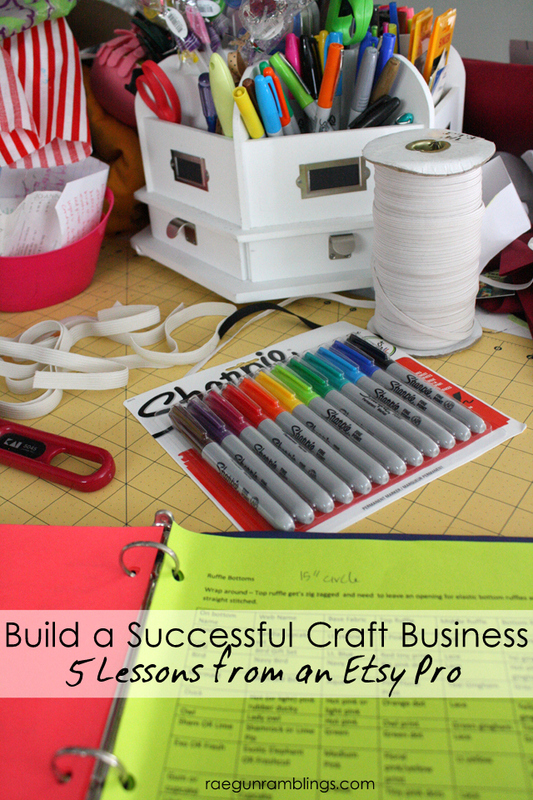 Take your hobby to the next level with these tips and tricks for building a successful craft business. 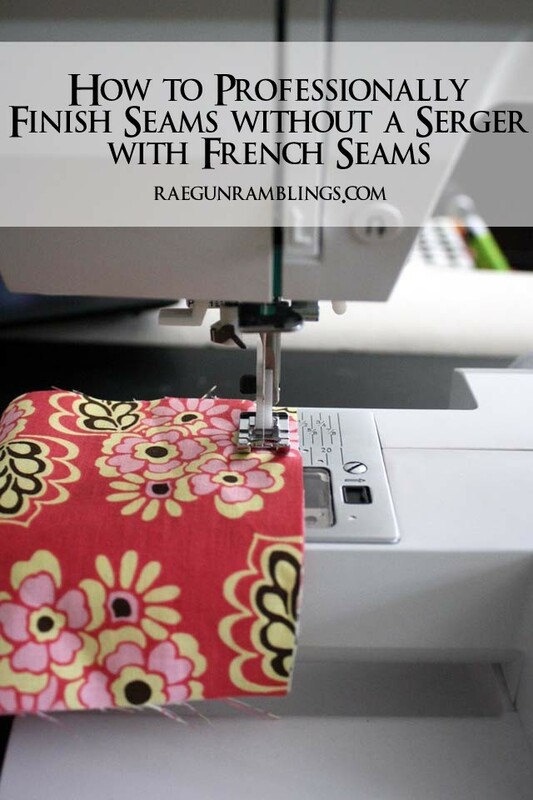 Learn how to professionally finish seams even without a serger. 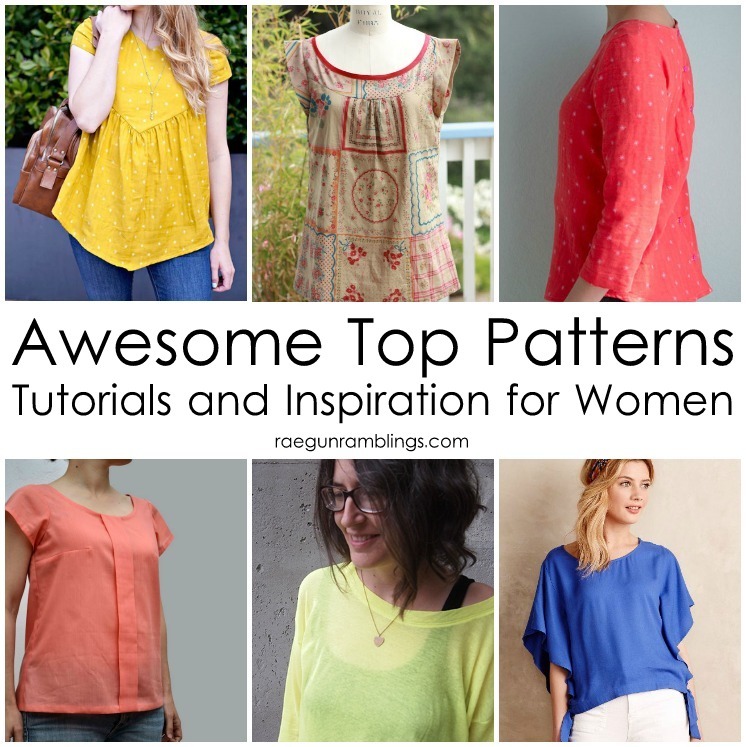 Great collection of top patterns and tutorials to sew! Fabric and probably some more notions/tools! I would love to get fabric to make a duvet cover and shams. I would buy fabric of course! I also need the loop turner you wrote about, I have never had one of those! Fabric and see if there are any gadgets I could use. Great tips and great giveaway! Thanks! Ps. I’ve been on the fence about a serger for awhile… Might just bite the bullet. I would use for fabrics! I would buy a large rotary mat. I’ve wished I’d had one many times. Fabric, and probably a few quilting rulers to go with it. And elastic, and thread, and a bias tape maker (hey $100 is a lot of $$!). Thanks for the chance to win! I would look and look and wander and wander. Then probably get material and storage containers. I would love to have $100 to spend on lots of fabric! Bias Tape Makers, Fusible Batting and Fabric….I would like to try fabric weaving. I’d spend it on more fabric, for sure! I agree with your must have items. I have all of them! Fabric, specifally curtain and upholstry fabric. I would love to stock up on fabric. What wouldn’t I buy? I go there weekly. I would probably buy fabric and new scissors. One of the gadgets I love to mark my fabric is the rolling chalk pens found in the quilting area of Joann’s. I have a white one and a blue one– they are indispensable! FABRIC, FABRIC, and MORE FABRIC!! Oh, and maybe some buttons :)…. I need to get some new rotary cutter blades–I go through a lot of them! Go to Harbor Frieght and buy replacement carpet cutter blades item # 97642 about a dollar a blade. I would by a cone thread holder and magnetic pin holder….. and anything else that caught my fancy! OOH! I’d buy a new cutting mat (maybe a rotating one? ), and more fabric of course! As far as one thing I can’t live without, definitely my wonder clips! If I won I would spend the gift card on fabric and thread. I think I would spend it on a Simplicity bias tape maker. Don’t bother, you can have mine. It is near usless. I would use it for fabric, and a rotary cutter! I would spend it on fabric, and I tool I love is my Ottlite. Would spend it on fabric to make a quilt for our bed as well as batting and maybe some rulers. I would get some elastics, thread, batting and I’d love to have a bias maker. I don’t know if I dare get more fabric! Thanks for the giveaway! I would buy the 18 mm rotary cutter, a loop turner and some large cones of thread and who knows what else! I would buy lots of fabric! Thanks for the giveaway! What an awesome giveaway – I love shopping at JoAnn!! With a prize like that I would get some fabric, a good pair of scissors, and that loop turner!! Thanks for the chance!!! This would be such fun to win and shop!!! I’d put it toward my daughters new big girl quilt! I would start by buying thread cones for my new serger I just got. I honestly would probably buy a bunch of fabric, but also invest in some fun sewing tools for myself! Shoot, maybe I’d even put it toward a new machine! I would buy fabric and sewing supplies. Fabric to make a quilt for my friend who’s son just finished boot camp! I would spend my gift card on fabric! My one must-have sewing tool is my seam ripper, altho I love my mini scissors that are extra sharp and come in so handy. Thanks for the giveaway! I’d buy some fabric for Christmas gifts! Looking to make some bean bag chairs and stuffed animals for my kids and niece and nephew. Fabric, or use it on a second sewing machine for classes! I would buy fabric and sewing books and patterns!! Please enter my name in the give away! Please enter my name in the contest, thanks!!! I would probably increase my fabric stash! I would probably get a magnetic pin holder and fabric. It would hard to chose though, they have so many amazing items! My sewing machine Fabric and a needle and thread I need new blades for my rotary cutter and of course more fabric Fabric Fabric!!!! I’d probably spend it on supplies for handmade Christmas presents! Stabilizer, Bias Tape, Spray adhesive, storage, tables, variegated thread, metallic thread, yarn, buttons, snaps, buckles, glue gun, mini iron, hotfix tool, fabric paints and, well I could keep going. I would spend my winnings on fabric and sewing machine needles.. I seem to be going through a lot of them lately. What a fabulous prize! One can never have enough fabric! Fabric!!! Luckily I have most of the tools I need….and truthfully I have tons of fabric….but who can have enough fabric?? I need a loop turner thingy–just now I’m making tiny button loops! And I need some organizing things–a thread display holder, to start with. I would use the gift card on fabric of course. My must have for my sewing room is my comic book boards to organize my fabric. I’d buy fabric, notions, & more fabric! I would spend the gift card on material or a rotating cutting board. New rotary mat and blades for starters. I would spend it on Fabric!!! You can never have enough. I only buy it when I have coupons considering I have way to much to use already but boy do I love having a stash! My one thing I couldn’t live without would be freezing paper since I use it to create patterns as well as copy patterns so I don’t have to cut the original apart for different sizes. Probably fabric. Or a new larger cutting mat, new large ruler, not sure how I’ve chipped off 3 corners of mine. I’d probably get fabric and thread. Thanks!! Fabric, fabric and more fabric and buttons. I’d by some scrapbook albums and page protectors. Great give away! I would love it! Fabric!!! I’d spend it on fabric, because I’m a fabriholic!!! I cannot live without my rotary cutter. I have a loveseat that I’ve been wanting to update so I would splurge on some Home Dec fabric. I would use the rest for thread and needles. 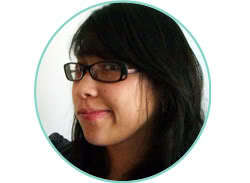 I’m so happy to find your blog! I love your style of writing and can totally relate to the baby brain! :) Can’t wait to explore all you’ve posted! I just used some birthday money to buy some of the sewing room stuff I was missing… so I would spend my gift card on FABRIC!!! :) I totally agree with your top 20 list. 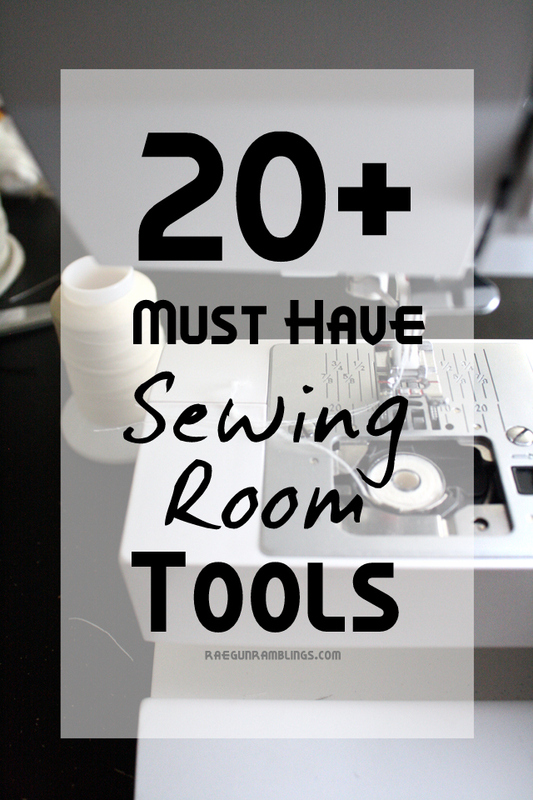 I have almost every single one and love them… especially the serger, changed my life a year ago! I would spend the $100 on elastic thread, serger cones, embroidery thread, going her scissors, a thread stand and of course….fabric!!!!! Fabric to sew for my girls!! I need a cutting mat! I would spend it on a large rotary mat or lots of fabric! I wish I could add more of these it would make everything go so much quicker and easier, but as I am not a die hard seamstress (just yet) I work with what I got. I’ve definitely learned what’s indispensable! Forgot to say what I would buy – baby brain :) – I would love to stock up on all the notions I never buy because they aren’t “necessities” like a bias tape maker, magnet wand, thread holder, ruffler foot, pinking shears, more pins, fancy buttons, elastic thread, and anything else I could find! I would probably spend it on fabric! I want to make some cute floor cushions for this winter for sitting in front of the fireplace. I need some batting and foam. I’d buy that. I would probably buy a good light for my sewing area. Needles, thread, basting spray, rotary blades and fabric! I would buy fabric, elastic, thread, batting….oh my! Would like to look into the possibility of a serger or some other tools out there. I would buy fabric! Specifically, knits. I want to make my daughter some pants and, heck, maybe some matching ones for me! :) And make curtains for my kitchen. And new pillowcases for my couch throw pillows…haha! I have a big list! I would like to look at the possibility of a serger or other tools. Thank you for offering this up! I’d buy cross stitch supplies. I would get some fabric and a few of the tools that you mentioned. notions, zippers, buttons, interfacing, fabric, I love it all! I would love some fabric to finish my kid’s Halloween costumes! Thanks! A larger cutting mat and more fabric! Notions ! It’s a drive to get to my closest Joann or any fabric store and so I end up ordering most of my fabric online. But I hate to order things like threads, interfacings, buttons etc from online. I need a big stock up run ! I would definitely use this for more fabric for my kids. I’m a fabric junkie…. so yeah… lots of fabric! I would buy as much fabric as possible. But there were also a few items on the necessity list I don’t have, like pattern weights and a loop turner. Might just have to pick up those too. Thanks for the great giveaway! I’d buy some knits to sew up into fall shirts. I would definitely buy fabric and buttons. Fabric, fabric and more fabric! I’d buy a ton of fabric! I’d love to make my son a beanbag chair for his dorm room like I did my daughter, and I would buy pellets to stuff it with. It takes a ton of them!! I would buy merchandise for making Foster children items. beautiful kona cottons, some new rotary blades and lots of pretty fat quarters! One of my must have crafting tools is a really good pair of scissors or rotary cutters. They gotta be sharp to do the job!! I might actually use the gift card for a cricut or silhouette machine so I can make iron on transfers and fabric paint stencils in a pinch for my kiddo’s clothes. I would get fabric and pretty notions!!! I love my seam ripper. I can’t live without it. I would buy quilt batting, machine quilting needles, thread, and more fabric for my stash. I would buy thread, material, cotton to crochet and rug canvases. I LOVE mine hope you like it too! Seam ripper for reverse sewing! I love Joanns. I just went today! yarns…learning how to crochet/knit, fabric (love), good cutting board and craft mat, heat tool, glue gun! I’m still a beginner and am learning to love sewing, but one of the challenges I face is living in a small rural town without a fabric or craft shop. So I have a long list of things I need and would like including fabric wish list for projects that I would love to do… but I feel like I’m constantly in limbo waiting till I get to the shop and can never just start something with may dismal fabric stash. This would certainly help to keep me motivated. I’d spend it on a rotating cutting mat, a square ruler for rotary cutting and fabric, fabric, fabric. Thanks for the chance! I would buy quilting notions. I love quilting and the associated notions can certainly add up. Would love to get a serger!! Fabrics, thread or craft for the kiddos. Thanks for a great giveaway! I would buy more fabric! I always need more fabric!! I love my wonder clips! Oh new rulers fabric snaps fabric thread fabric batting and did I mention fabric? I need a new cutting matt – a really big one! A wrist pincushion makes the work quicker and easier to always have them nearby. I would by fabric beautiful fabric. I need one these fancy loop turner because when I have something like that to make, I always try to avoid it and find an alternative. I would spend than money on more rulers and another cutting mat because mine is getting old ! I’d spend the card on the crazy expensive Frozen fabric for my soon to be kindergartener. Any thing left over would go to solids/semi-solids to blend with prints I have in my stash. I’d put it towards a Go BABY cutting system! Freezer paper is great for tracing patterns! My craft room isn’t complete without my trusty seam ripper! I’d spend the ENTIRE gift card on my Granddaughter Rayven! :-) Thanks for the giveaway!! I would spend on fabric, of course. Also on basting spray – I love using it. It makes it so easy to get the layers together without puckers. books…sewing, quilting, knitting……and some martha tools…..
Thread! I never seem to have the right color around. I would get a new blade for my rotary cutter, maybe a new mat, and of course, fabric! I would spend my winnings on a new cutting mat and rotary cutter. Not strictly a sewing tool, but I need some masking tape or the top of a post-it when I’m sewing — there’s always some spot I want to mark temporarily and a bit of tape does the trick. I would spend on fabric– probably wool felt! If I would win I am new to quilting so I would buy fabric and thread. Thanks!!! I would put the gf card towards a new sewing machine. I would spend the money on fabric for a Sally costume (Nightmare Before Christmas) and a Mad Hatter costume. And maybe some supplies for a little baby Beefcake costume (Gwar). Can’t wait for Halloween!! I would get some Accuquilt dies. Thanks for the contest. There’s no fabric store where I live except for hobby lobby, so I would spend it on fabric! I guess I should get over it, but I just don’t like shopping for fabric online. It’s not the same!!! You mentioned disappearing marking pens. I love using Pilot’s Frixion pens for marking…the marks don’t disappear until you iron over them…helpful when you have little ones around and don’t always get to finish a project before they wake up or need you! I’d put it towards a serger! I need fabric for a couple of first day dresses, and an Elsa dress! Fabric! I be been trying to save for some but money has been tight lately. This would really be an answer to my prayers! I got some small pallets from work and want to turn them into ottomans, so I would buy foam and fabric. Thanks for the giveaway. With Christmas and Halloween coming up, I could totally use this! I love the list of 20 things you need. Fabric and thread! And new scissors. :) Thanks for the giveaway! Fabric. I always seem to purchase fabric there. Thanks for the giveaway. I would buy some craft supplies to make some fall/Halloween crafts. I would buy some fabric. I have so many projects I want to do! I very much need to replace my quilting rulings. I use mine all the time, but my favorites were snapped in half during a recent move. I’ve glued them back together, but they just are not the same…After I’ve replaced those, I would buy fabric (of course). I would buy a bolt of Pellon Shape Flex SF 101, wonder tape, fabric, and thread! Thanks for the great giveaway! I will spend it mostly on Fabric and Pellon I don’t have enough! My rotary cutter and mat are an absolute must! I would love to get some fabric and notions! Have been eyeing a lamp and several fall vogue patterns! I’d get a good pair of scissors and then hide them! I would buy fabric, fabric, and more fabric! Fabric, Fabric and Fabric! Buying lots of thread too! I would buy a new Olfa cutting mat and some Accuquilt dies. Fabric! I am a beginner at sewing and don’t have the “stash” everyone talks about, so I’d love to go in and just buy whatever caught my eye, instead of limiting myself to my current project needs. I have been on a self-imposed fabric buying moratorium for months, and I would SO SPLURGE on fabrics for Christmas gifts and projects for my girls at Joann! WHAT FUN! Oh, bolt of Shape Flex … flannel for baby blankets … patterns …. lots of great stuff! I love this blog and Facebook page. thank you for the giveaway opportunities. supplies for Halloween costumes, maybe a new rotary cutter. I would buy fabric, elastic, and thread. I am sure I could find more things to buy as well. I need to buy storage for my re-vamped craft room. Thanks for the opportunity! FABRIC. And thread, really. Twice in the last week I’ve found myself using a questionable thread color because I didn’t have one that matched. OOH and one of those spool racks. I would probably put it towards a serger because I have wanted one forever!!! I would spend it on new fabric and notions! Great list. Always have back up rotary blades and bobbins. I would get fabric and quilt batting! I would spend it on fabric for my daughter’s junior-senior dress. I’ve been making purses and bags lately, so I’d spend it on Peltex and other interfacing – it’s boring stuff but necessary to provide good bones for bags. Thanks for the great giveaway! We’re talking Halloween around here so patterns and fabric! Can’t live without my sewing light! And would buy more fabric! I am a “frequent flyer” at Joann’s! I would buy holiday fabric to make table runners for my dear friends and family who live a long distance. I just started learning to quilt, and love the creativity in making simple things. Thank you for the giveaway. I would use it toward a Silhouette! I’ve wanted one for sooo long! I never seem to win one, so it’s time to buy one! LOL! Thanks for hosting the giveaway! This is a great list – I have a lot of these, but it’s always great to check out new notions! And I’m looking forward to your embroidery scissors seam rippers post – I always rip the fabric when using my seam ripper – maybe this will help! I am in desperate need of some new notions, but I always seem to walk out of the store with new fabric instead!! I have to buy a sewing ham, and a roll also. I find using the iron makes it easier to sew. I would also get some more fabric. Thanks for hosting this nice giveaway ! I would include extra blades for the rotary cutter. There’s nothing worse than being inspired to tackle a project, then discovering your blades are dull, dull, dull! And they are kind of expensive, so they may not be in the budget when inspiration strikes. Now you know thing on my shopping list of I won the Joann gift card. Thanks for your blog! I would spend it on fabric and then more fabric. Thanks! Quilt batting, pillow forms and new cutting mat and rotary cutter. I’m just starting to sew. I have a machine and a good pair of scissors (thanks mom) and need pretty much everything else! would love to win this!! Most likely fabric and notions. I need more quilt batting! I will most likely spend the whole thing on fabric! I need to make a couple blankets for my toddler and a car seat cover for my newborn. I would spend it on dissapearing markers and a rotary cutter. I’m a beginner, so there are a lot of things I have to purchase. Winning this give-away would be a good help! I’d definitely have to look into getting a serger! I do a lot of sewing for charity, so I would stock up on fabric, thread, sewing machine needles, and a new pair of scissors. Thanks. I would use it to buy a pair of nice left handed sissors. Thanks! You just cant have too much fabric in your stash! I would spend the gift card on fabric. I’ve been wanting to make a 1950’s style dress but I don’t have enough fabric to do so. I would use the gift card to help replace my sewing machine. It bit the dust and I’m finding that life is just no fun without it. Love your list of must haves. I would spend my gift card on a new rotary cutter and mat and definitely a new iron! This would be so amazing to win lots of things come to mind that I could use!! I know get some great fabric! I would probably spend it all on fabric or maybe some new shears. I would spend it on thread, rulers and or a good pair of scissors. Fabrics and embelishments/accessories.. love doing bunch of sewing crafts! I need to try this loopy tool. And someday I shall see about a serger. I’d buy lots of fabric to make doll clothes for my granddaughters! I need a cone thread holder and didn’t even know they existed until I read this post. Thank you! I’m off to get one. I would love to buy fabric for new duvet covers. I loved reading this. Thank you for putting this out there. I will have to look into the loop thing. I would definitely buy some more fabric! And look at some sergers too. I have been curious about them bit haven’t used one yet. Upgrade my tools and storage. I would spent my gift card on sewing classes. I want to learn how to really use my serger and learn real tailoring techniques. Right now I can serge a straight line and my tailoring is make it up as I go alone. I would spent my gift card on sewing classes. I want to learn how to really use my serger and learn real tailoring techniques. Right now I can serge a straight line and my tailoring is make it up as I go along. My favorite things to buy at JoAnn’s are ribbon and buttons. But I never end up using them. Still fun to buy. Fabric…Fabric…Fabric.. and maybe a larger cutting mat and some rotary blades (you can never have too fabric) It’s the season for fleece and flannel and I love making soft and cuddly quilts. I love my rotary cutter, and what I would buy is a circular rotary cutter. There’s something about getting a smooth perfect circle that makes me happy. I would spend it on the piles of fabric I will need for my next project! I would use the money toward fabric for my new house. Moving with the next couple months. Window treatments! I could always use more fabric – and not for my stash either. For projects! Really! And I really want to give variegated thread a try too. Thanks! I would use this to get fabric and little knick knacks I may not have normally bought while learning to sew for my baby and myself. Oh man, I am already smiling and imagining all the projects I could get started on with this gift. I would get the very large self-healing cutting mat. I was looking at it last week, but it was $199 and change, and I just couldn’t justify getting it when I needed other stuff. With a 50% off and this gift card, it would be free! I could really use a larger cutting mat. And new rotary blades. My favorite sewing tool is my Bodkin. I’ve had it so long it has a bend in it. I would love to be able to purchase a new great light and some supplies for my new surger..My Hubs is in the process of making me a new craft room and I am sure I will need lots of new stuff! I’m with you on the embroidery scissors, I use mine for EVERYTHING. If I won the gift card, I’d be getting lots and LOTS of fabric :) The stuff I normally wouldn’t buy because it was too expensive. Fabric and I really need a new Fiskars paper cutter ? If I were the lucky gift card winner, I would stock up on interfacing, Soft and Stable, bag-making hardware & Kona cotton solids fabric! Jo-Ann’s has everything a sewer or crafter could want. Iwould definitely buy fabric and new rotary cutting blades. I need some new quilting feet and batting, and backing. Lots more, but those are the main items. I would love to have new fabric to make Halloween costumes for my kids. I would probably buy rotary cutter blades and fabric. But if they had an overlock on special I would use it toward that. I sew for the 4 females in this house and could really use one. I’d spend it on lots of fabric to make the most outrageous Halloween costumes for all three of my granddaughters, my little angels are going to get some handmade costumes from their Nana this year if I win. I need to get embroidery scissors! What an awesome way to remove stitches! I also need a good pair of fabric scissors. I’ve started using alligator clips instead of pins to hold fabric together, soooo much easier for me. I’d first buy scissors, then interfacing and fabric! I’d buy fabric for garment sewing, and a rotary mat for cutting blocks. Great plug for Ginger/Gingher actually, scissors. They are worth every penny. The quality has not changed over the years. My first pair didn’t need sharpening for a good 5 years…nice list, I think I’ve got it covered. Seam ripper! I couldn’t do without mine. Just wanted to mention that one should NEVER place their magnetic pin holder near their sewing machine IF it is computerized. It will mess the computer up.